An inflatable orca, an umbrella, buckets and towels are some of the necessities these people needed while spending the day at the beach at Last Mountain Lake in Rowan's Ravine Provincial Park in the Qu'Appelle Valley, Saskatchewan. People vary in what they find necessary to bring to the beach, but one should always remember sunscreen and a hat to avoid getting too much sun. The whale is one of the added necessities which this group of people can enjoy while swimming in Last Mountain Lake in the Qu'Appelle Valley in Saskatchewan. A campsite is located just off the beach where visitors can stay in tents, trailers or RV's making it easier to haul all their necessities to the lake each day. The beach winds around the shoreline giving people plenty of room to spread out and enjoy the quietness without being too close to the next beach goers. Picture of a variety of necessities needed at the beach at Last Mountain Lake in the Qu'Appelle Valley in Saskatchewan. Last Mountain Lake extends for about 70 kilometers and approximately 2 kilometers across providing ample room for boaters, fishermen, water skiers, jet skiers, canoeists and swimmers. 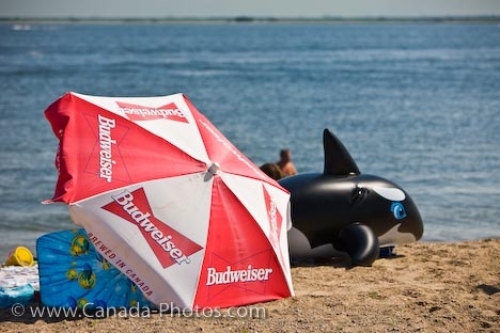 Inflatable orca and sun umbrella on the beach of Last Mountain Lake, Rowan's Ravine Provincial Park, Qu'Appelle Valley, Saskatchewan, Canada.